When there is clutter is on every counter, dishes fill the sink, laundry on the couch and junk mail on the coffee table, the home is an overwhelming place to be. Often times when looking at this, we can see that there is a definite need to rid the home of clutter. 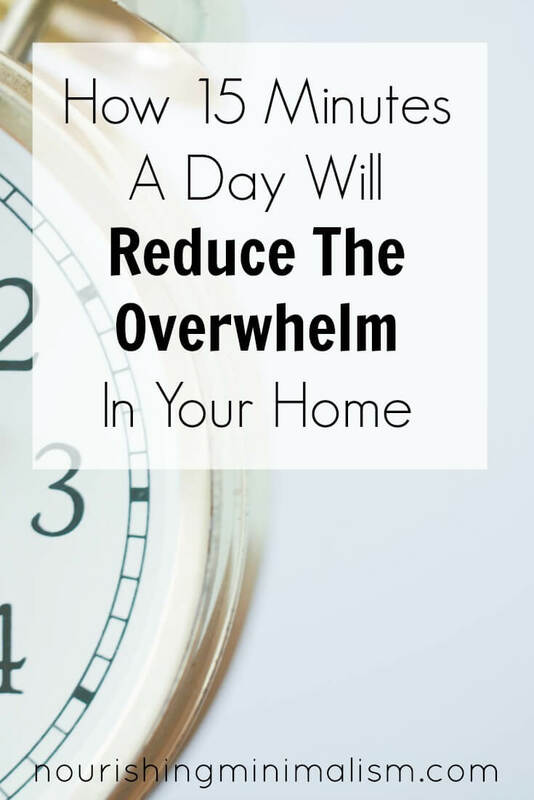 And it’s true, you do need to rid the home of clutter, but to get rid of the overwhelm, one has to address daily habits as well. 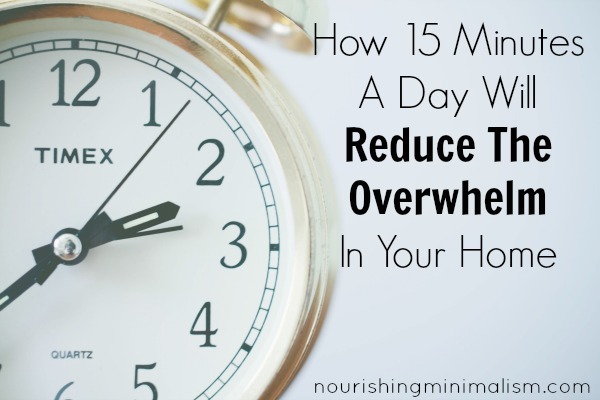 Building a daily rhythm of habits that keep the overwhelm at bay. In order to achieve a clean & organized home, you have to implement both of these actions. One may get their possessions down to 100 items, but that won’t automatically make their home clean and tidy- everything would still be out on the counters and on the floor, if the simple daily habits aren’t changed as well. One has to create a daily rhythm of tidying up to have a clean, clear home. The Jane and Mary in our story have the same size house, same amount of kids and same job – but how they function through the day is very different. Jane woke up in the morning, got out of bed and wandered into the kitchen for breakfast. There were dishes in the sink, but still plenty in the cupboard, so she retrieved bowls, spoons & cups and gave breakfast to the kids, putting the newly dirtied dishes into the sink. There was still plenty of clean dishes, so no need to do anything with them right now. Mary woke up and immediately made her bed. She took a quick shower, leaving her pajamas hanging on a hook in the bathroom, got dressed for the day and went to the kitchen for breakfast. She completely unloaded the dishwasher that was run last night and then got out clean bowls, spoons & cups for breakfast. After breakfast the newly dirtied dishes are rinsed and put right into the dishwasher. Jane went back into the bedroom, tossed her pajamas on the chair near her bed, picked up some clothes that were on the floor, took a shower and got ready for the day. She then had the kids put their lunches together while helping one child finish their math homework, and ran out the door in a rush because another child was missing a shoe- found it! Not a minute to spare. Mary supervised the kids making lunches while she threw a load of clothes in the wash and set meat out to thaw for dinner. After the kids got lunches made, the counter was wiped off, backpacks were packed and everyone loaded into the car. Jane got home with the kids, who left their backpacks sitting by the door and ran off to play with neighbors. Jane tossed the mail on the coffee table, sat her purse on the counter and stood in the kitchen wondering what on earth to cook for dinner. Something from a box was easy, so she’ll make that, but forgot to buy any veggies, so will eat another meal without them- at least the kids are getting food, right? Mary got home with the kids, sorted the junk mail into the trash by the backdoor, set the one bill in the mail holder on the desk. Put the laundry in the dryer and had the kids hang up their backpacks, empty their lunchboxes and put any lunch containers in the dishwasher. She had the kids do any homework before running of to play. The meat was thawed so she got out a salad and heated up the grill. Jane got dinner ready, set out dishes and the family ate together. Everyone had different plans for the evening, so they ran out as soon as they were done eating. The dishes needed to be done, but Jane had had a long day at work and it just seemed too exhausting, it could wait for tomorrow. There was enough dishes for breakfast anyway. Mary got dinner ready, everyone ate together and then when they got up from the table each person put their own dishes in the dishwasher before going their own direction. She threw in the other dirty dishes from dinner and then started the dishwasher. She folded and put away the one load of laundry and then sat down for the evening. As a disclaimer: I’m naturally a “Jane”. This is not intended to dish out any sort of mommy guilt that is so prominent these days. If you were to look into their homes, Jane’s is filled with clutter and Mary’s is not. Mary has cleaning and decluttering habits built into her day. Putting dishes immediately in the dishwasher is just as important as how she sorted the mail before it even came into the house. It’s not that we have to become someone we are not, but if we value a clean & organized home, we have to implement some sort of maintenance habits into days. Start simple. Keep your routine as simple as possible. You can always add more to your routine when it is well established. But if you are just starting: just focus on doing the dishes in the morning and evening. If you add too many chores in the beginning, the whole idea of getting it done is overwhelming: keep the goal achievable. Only focus on the dishes for the first 30 days. Use a chart. Remember getting stars on your school papers as a kid? Seeing evidence of your accomplishments gives more motivation to keep going. Put a star on the calendar when you do it, or print out a chart set and check off each time you get it done to see your progress. If you are worried that 15 minutes a day isn’t enough to do the dishes… that’s about how much time I spend doing the dishes each day. We do them after each meal, normally running the dishwasher after lunch and dinner. And we have 7 people in the home. 🙂 If you’re anxious about it, time yourself next time you do the dishes. So often we think it’s a bigger job than it actually is. Thanks I’m totally a jane lol. I think it they’ll still be there later. I want to start building these habits into my day so that it’s maintained and not a huge stress factor all the time every six weeks or there abouts seems to be my break point I’ve noticed where I start to lose the plot. I like the idea of a chart I might do that to visually keep myself motivated. Thanks again you’re so real and it’s great cus you’re on the front line so to speak so we can all relate. That add for your course that drops down to cover anything I want to read is adding to my overwhelm. I may stop reading your blog because I find it so irritating. I thought you might want to know that. It feels so opposite of nourishing or minimalism. Thanks so much for this blog post! LIke everyone else, I’m here BECAUSE I’m a “Jane” naturally, and I want to change that! This has been really helpful for just seeing where I am making errors in my day, and how little things can make a difference to change. Thank you! I am naturally a Jane as well 🙂 When we moved into our current home and we finally had a dishwasher, I made a goal to never go to bed with dishes in the sink. Aside from sick days or days that are completely out-of-the-ordinary-busy, i have kept that routine and it has blessed my life! But the rest of my routines are in bad need of a pick-me-up. One question i have is how to balance routines with young children and babies that are unpredictable. it seems that as soon as i get started on a morning routine, my toddler decides he’s going to go through a new phase of waking up at 5:15 every morning, or something similar. Any tips for getting a handle on life in spite of the unpredictability of littles would be lovely 🙂 Love your blog! Thanks for everything you share. I find myself coming back over and over again when I have questions about minimalism and ways to simplify my life. You have had a huge impact on me through your posts! ONE DAY I HAD 2.58 LEFT ON MY OVEN TIMER BEFORE DINNER WAS READY SO FOR FUN (SERIOUSLY MUST HAVE BEEN DESPERATE THAT DAY!!) I DECIDED TO TRY AND BEAT THE TIMER TO UNLOAD THE FULL DISHWASHER AND RELOAD IT! SURPRISINGLY i managed it with seconds to spare… it can be done and it doesn’t take long! When the dishes pile up and I don’t particularly want to do them, I put on some fun music and commit to doing five minutes of dishes. If after that time is up I want to quit, I give myself permission to. But 95% of the time I finish them – after all, my hands are already soapy and I want to keep listening to my favourite songs! I’d like to get into the habit of doing the dishes after every meal instead of just once a day. But it’s a start!